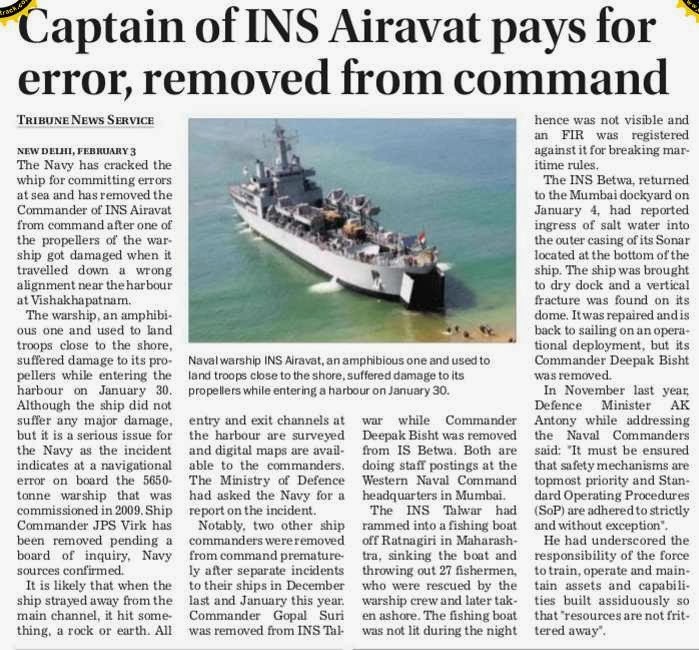 The Navy has cracked the whip for committing errors at sea and has removed the Commander of INS Airavat from command after one of the propellers of the warship got damaged when it travelled down a wrong alignment near the harbour at Vishakhapatnam. The warship, an amphibious one and used to land troops close to the shore, suffered damage to its propellers while entering the harbour on January 30. 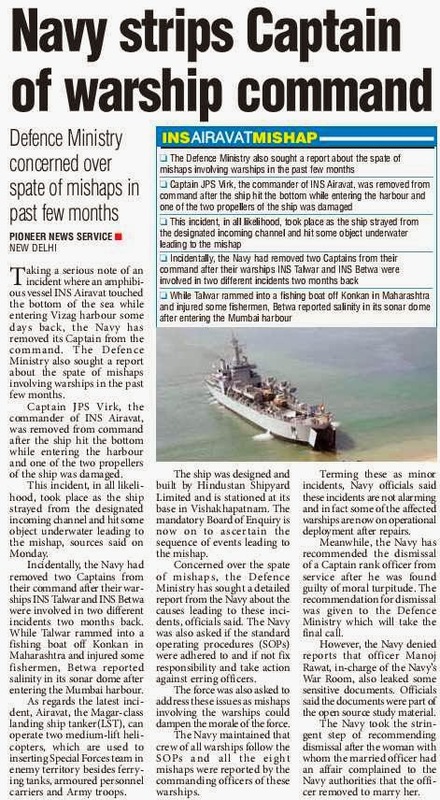 Although the ship did not suffer any major damage, but it is a serious issue for the Navy as the incident indicates at a navigational error on board the 5650-tonne warship that was commissioned in 2009. Ship Commander JPS Virk has been removed pending a board of inquiry, Navy sources confirmed. It is likely that when the ship strayed away from the main channel, it hit something, a rock or earth. All entry and exit channels at the harbour are surveyed and digital maps are available to the commanders. The Ministry of Defence had asked the Navy for a report on the incident. Notably, two other ship commanders were removed from command prematurely after separate incidents to their ships in December last and January this year. Commander Gopal Suri was removed from INS Talwar while Commander Deepak Bisht was removed from IS Betwa. Both are doing staff postings at the Western Naval Command headquarters in Mumbai. The INS Talwar had rammed into a fishing boat off Ratnagiri in Maharashtra, sinking the boat and throwing out 27 fishermen, who were rescued by the warship crew and later taken ashore. The fishing boat was not lit during the night hence was not visible and an FIR was registered against it for breaking maritime rules. The INS Betwa, returned to the Mumbai dockyard on January 4, had reported ingress of salt water into the outer casing of its Sonar located at the bottom of the ship. The ship was brought to dry dock and a vertical fracture was found on its dome. It was repaired and is back to sailing on an operational deployment, but its Commander Deepak Bisht was removed. In November last year, Defence Minister AK Antony while addressing the Naval Commanders said: "It must be ensured that safety mechanisms are topmost priority and Standard Operating Procedures (SoP) are adhered to strictly and without exception". He had underscored the responsibility of the force to train, operate and maintain assets and capabilities built assiduously so that "resources are not frittered away". Former director of the Intelligence Bureau and member of the National Security Advisory Board PC Haldar today said Maoists were focusing on interiors of eastern Assam to set up bases and spread their tentacles to the Northeast India. Addressing a select gathering here, he said the presence of Maoists in the Northeast had the potential to create serious “strategic security complications” and urged the security establishments to take seriously the Naxals’ attempts to consolidate themselves in the area. Haldar, who is also the government’s peace interlocutor for Assam, said the Maoists’ decision to set up bases in eastern Assam, along the border with Arunachal Pradesh, has assumed significance because of its proximity to the international border and the traditional routes that insurgent groups in the Northeast have been using to access its bases in Myanmar. NEW DELHI: Months after the then chairman of the Chiefs of Staff Committee NAK Browne wrote to the Election Commission seeking the right of members of the armed forces to be registered from the place of their posting, just like a general voter, the poll panel has positioned itself against the proposal. Sources in the EC told TOI that it was disinclined to allowing soldiers to vote from their cantonments/military stations, as the results in such constituencies could be influenced by sheer number of such voters on the rolls rather than the locals' preference. The risk, an EC official said, was more in field stations across Jammu & Kashmir and north-eastern states like Arunachal Pradesh and Sikkim, which are thinly populated but have heavy military presence. Besides, in many constituencies of Kashmir, where the voter turnout could be very low, just the participation of the local military unit may alter the result. 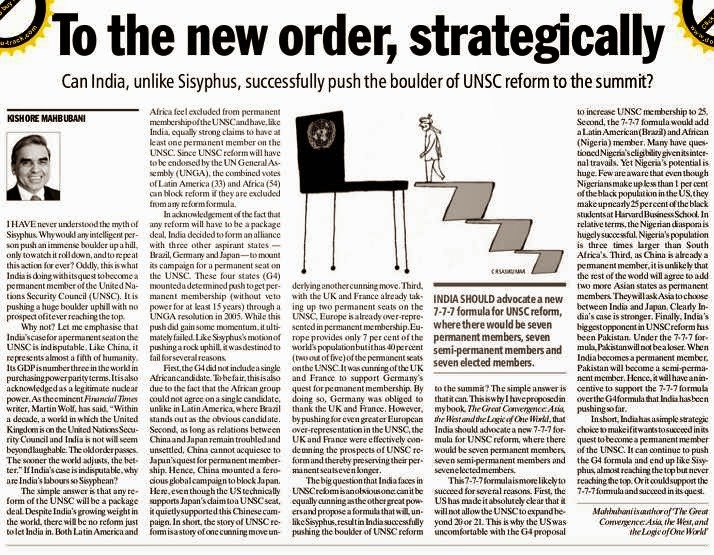 "Most importantly, how can one rule out the risk of a ruling dispensation trying to influence results in a particular way by getting a large unit, like a brigade, to relocate to a particular area just six months before a poll?" asked the EC official. The commission may present its arguments against allowing service voters to vote from the place of their posting, to the defence ministry and the Union home ministry when their representatives meet here on Tuesday to discuss the issue of voting by the armed personnel and central paramilitary forces. 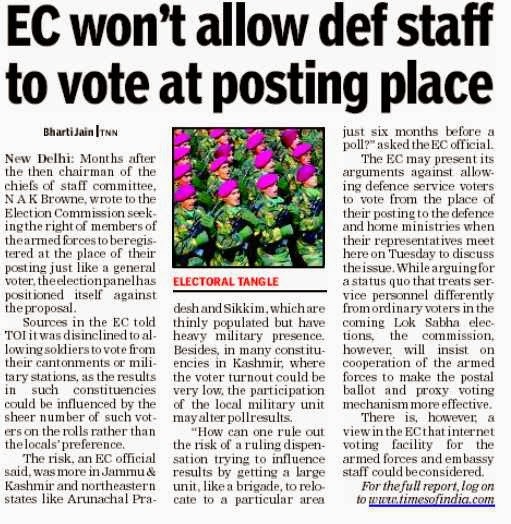 While arguing for status quo, that treats a service voter differently from an ordinary elector, in the ensuing general elections, EC, however, will insist on cooperation of the armed forces to make the postal ballot and proxy voting mechanism more effective. There is, however, a view in the EC that internet voting facility for the armed forces and embassy staff could be considered. As for the central forces, the EC will, at Tuesday's meeting, impress upon home ministry officials to ensure that paramilitary personnel on poll duty are issued election duty certificate and their vote recorded before they leave their base stations. The postal ballot system for the armed forces has been termed a failed experiment by activists and NGOs alike, who argue that the delay in delivery of postal ballots to the service voters prevent them from being returned in time for counting. Also, awareness about the proxy voting option is rather limited and the procedure seen as cumbersome. Apart from Air Chief Marshal Browne, who petitioned EC around October last year, several NGOs/institutions and MPs like Rajeev Chandrashekhar have been demanding right of armed forces to be enrolled as general voters, arguing that there was need to do away with the stipulation that soldiers, to be enrolled as general voters, must be residing with their spouse for three years or more. Incidentally, this is more of a disabling provision as the Army can provide family accommodation to no more than 30% soldiers at a time. Also, there is opposition to other norms that say that a service voter's wife can only be registered where her husband is posted, and another that allows wife of a soldier to be registered as a service voter but does not extend the same facility to the husband of female service voter. Samtel, which will co-produce digital displays with General Dynamics, predicts the Indian Army could buy more than 15,000 new systems for vehicles such as the T-72 tank in the next few years. NEW DELHI — The Canadian arm of General Dynamics and India’s privately held Samtel Avionics have agreed to co-produce digital display systems for the Indian Army and GD. Samtel is eyeing the display market here for the Army, Navy and Air Force, which is estimated to be worth $90 million. The company aims to manufacture for General Dynamics a variety of displays for more than $15 million each year by 2015-16, a Samtel executive said. The Indian Army has a potential need for more than 15,000 displays for use aboard the Future Infantry Combat Vehicle, light armored multipurpose vehicles and upgraded infantry combat vehicles and for the upgrade of T-72 tanks, the Samtel executive said. Samtel Avionics is currently building cockpit displays for the Indian Air Force’s Russian-built Sukhoi MKI aircraft. Samtel and France’s Thales have a joint venture for manufacturing in India helmet-mounted sight and display systems, infrared search and tracking systems, and modern avionics systems for the Indian and export defense markets. The joint company is manufacturing displays for the Mirage 2000 upgrade that the Indian Air Force has contracted with Thales and is also preparing to supply displays for the winner of the $12 billion Medium Multirole Combat Aircraft project, in which French company Dassault’s Rafale is the selected aircraft. The Samtel-Thales joint venture was launched in 2008 with an equity capital of $12.5 million in which Samtel holds a 74 percent stake while Thales holds 26 percent. The Army has started court martial proceedings against half-a-dozen of its officers and jawans involved in the April 2010 staged encounter in which three Kashmiri youth were shot dead in cold blood in Machael area along the Line of Control after being lured with job offer. In December 2013, the Army had indicted Col. D.K. Pathania, Major Upinder, Subedar Satbir, Hawaldar Bir Singh, sepoys Chandra Bhan, Nagendra Singh and Narendra Singh in the fake encounter case and ordered their court martial. Investigations carried out by the Army and J&K police separately and spread over three years confirmed that Major Upinder of 4 Rajput Battalion and others had entered into a criminal conspiracy with Abbas Hussein, a resident of Kamalkote village in Uri area near the de facto border and a soldier of 161 Battalion of Territorial Army, and lured three youth Shehzad Ahmed, Muhammad Shaffi and Reyaz Ahmed of Nadihal village of Baramulla district to Machael on the promise that they would be provided with jobs in the Army. The accused Army officials have since been attached. The Army’s action comes after its “court of inquiry” into the incident submitted its final report in November 2013. The “court of inquiry” was led by then commander of 68 Mountain Brigade, Brigadier G.S. Sangah, now a major-general, which found the accused guilty of the crime. New Delhi: The commanding officer of an Army Intelligence unit and a Captain-rank woman officer are under the scanner after a purported sting operation suggested that they were allegedly involved in extra-judicial killings and a dacoity case in Nagaland and Assam respectively. 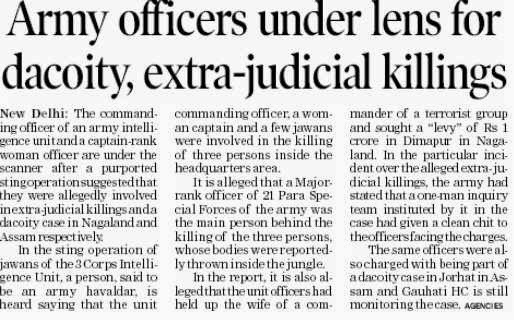 In the sting operation of jawans of the 3 Corps Intelligence Unit, a person, claimed to be an Army Havaldar, is heard saying that the unit Commanding Officer, a woman Captain and a few jawans were involved in the killing of three persons inside the headquarters area. It is alleged that a Major-rank officer of 21 Para Special Forces of the Army, was the main person behind the killing of the three persons, whose bodies were reportedly thrown inside the jungle. In the report, it is also alleged that the unit officers had held up the wife of a commander of a terrorist group and sought a "levy" of Rs 1 crore in Dimapur in Nagaland. In the particular incident over the alleged extra-judicial killings, the army had stated that a one-man inquiry team instituted by it in the case had given a clean chit to the officers facing the charges. The same officers were also charged with being part of a dacoity case in Jorhat in Assam and the Gauhati High Court is still monitoring the case. The Army investigation processes have also not been completed in the last two years. The case had taken interesting dimensions in 2012 when the then Army Chief Gen VK Singh had put present Vice Chief of Army Lt Gen Dalbir Singh Suhag under the promotion ban for mishandling of the dacoity case. Ajai Shukla: Does the military threaten democracy? At the emotional high point of President Barack Obama's State of the Union speech last Tuesday, he turned to Sergeant First Class Cory Remsburg, an army ranger seated next to Michelle Obama. The president invoked Sergeant Remsburg, blind in one eye and riddled with shrapnel from a roadside bomb on his tenth combat deployment in Afghanistan, as a reminder of the price paid to uphold America's values. Sergeant Remsburg's father helped him to his feet. The audience rose and cheered, many cheeks wet with tears. Two days earlier, on Republic Day, India's leaders had paid homage to our martyrs. Prime Minister Manmohan Singh drove in a heavily protected convoy down Rajpath to lay a wreath impassively at what serves as a national war memorial. Later, President Pranab Mukherjee, without a flicker of emotion, handed a medal and certificate to Karunam Venkatam, the 67-year-old father of Sub-Inspector K Prasad Babu, an Andhra Pradesh policeman who died last April fighting Maoists. Mr Venkatam, who struggled not to break down, was clearly alone in his personal encounter with a patrimonial, uncaring state. It is no secret that India's political and bureaucratic class is oblivious to its armed forces; nor can one expect better from a governing class whose indifference to its starving and undernourished millions has been described in these pages as a crime against humanity. Still, the instinct for self-preservation alone should focus our rulers' attention on the military's dire financial and organisational state, which - appallingly - is due at least partly to the fear that too much nurturing and strengthening might turn the armed forces into a threat to our own corrupt elites rather than to those ill-disposed towards India. 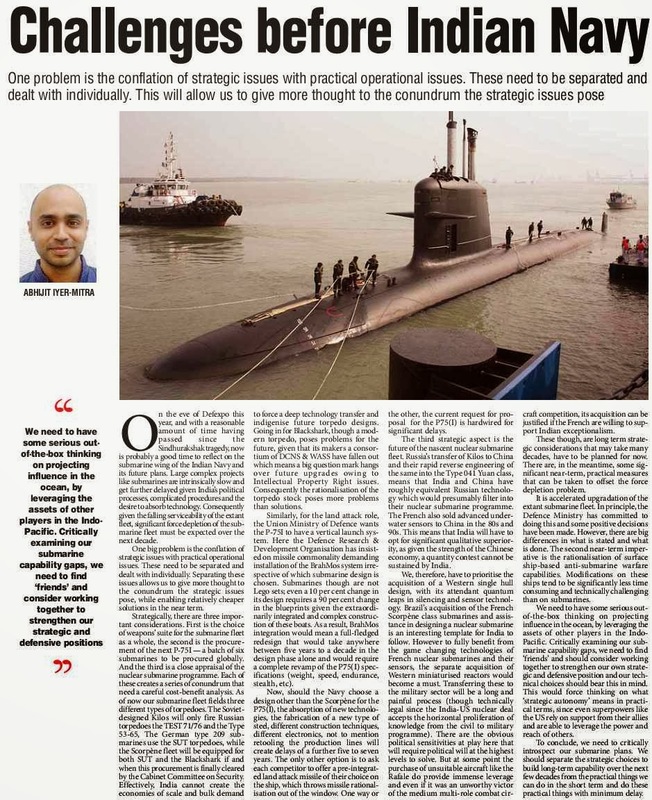 Several articles in this newspaper (most recently, "Arms acquisitions languish without funds or coordination", February 3) have highlighted the worrying state of military modernisation. This year the military got just Rs 2,955 crore for new equipment, while Rs 64,680 crore of the modernisation budget went towards instalments for weaponry bought during previous years. Next year, there could be even less for new buys. More funds would be welcome, but India's fiscal position limits military expenditure. Yet it costs nothing to optimise expenditure by co-ordinating between the army, navy and the air force. With the services competing, as organisations do, to build their respective empires, roles, responsibilities and capabilities are wastefully duplicated. Yet politicians and bureaucrats fear appointing a tri-service chief who could co-ordinate budgeting and long-term planning to curb wasteful expenditure. In 2001, a group of ministers (India's strongest version of a committee) recommended appointing a five-star "chief of defence staff", or CDS, who would command all three services. In 2012, a warier Naresh Chandra Task Force recommended appointing a "permanent chairman, chiefs of staff committee", or permanent chairman COSC - a significantly less powerful, four-star, tri-service chief whose role would be limited to tri-service planning, long-term budgeting and acquisitions. 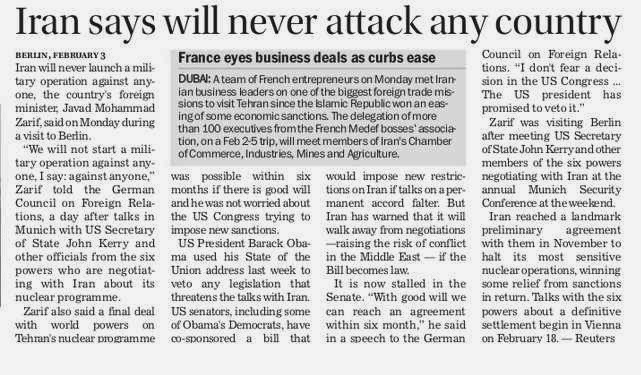 Yet senior bureaucrats say they would never allow a tri-service chief, since that would concentrate too much power in the hands of a military commander. An insecure political class, with little knowledge of the military, has unquestioningly internalised the fear that a powerful tri-service chief would threaten democracy. The last army chief, V K Singh, bolstered this nonsensical argument by facing off with the government because of his desire for another year in office. The politicians and bureaucrats miss the point that V K Singh could never have credibly threatened democracy. Army power is distributed amongst six field armies, each headed by a lieutenant general; a successful coup would require support from all six army commanders. There are five operational air force commands, each with the firepower to stop a coup. The navy has another three operational commands. The idea that a rogue tri-service commander could subvert three service chiefs and 14 field commanders is incredible and mischievous. Indeed, the Naresh Chandra recommendation to appoint a permanent COSC - a fourth four-star general to supplement the existing three service chiefs - diffuses, rather than concentrates, military power. Currently, the senior-most service chief, General Bikram Singh, ex-officio chairs the COSC. 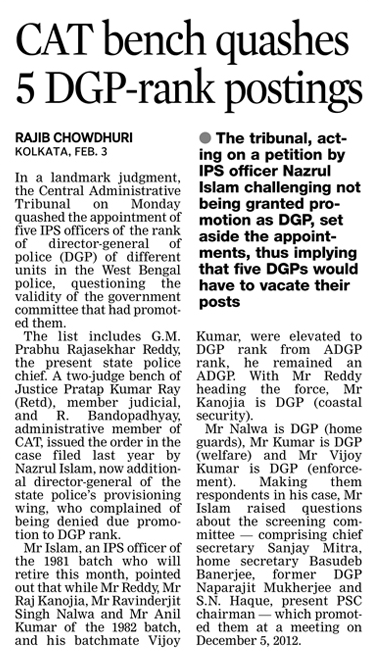 Appointing a permanent chairman would obviously lessen his power, while strengthening tri-service functioning. 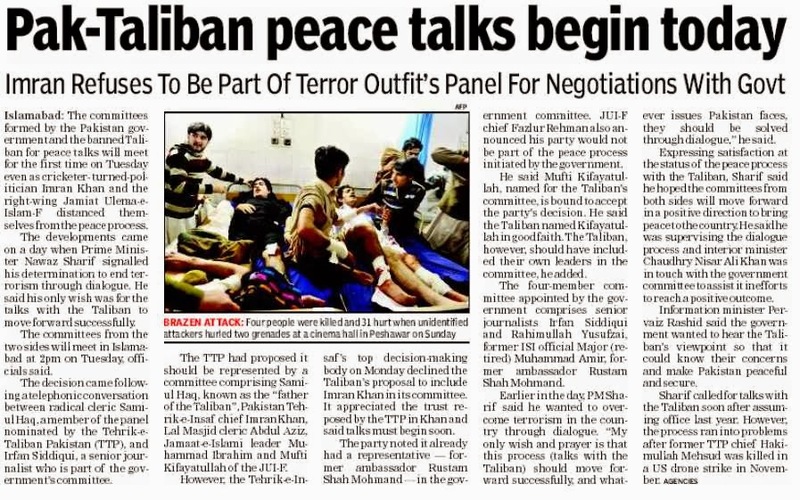 To justify their inaction on appointing a tri-service chief, the last two governments - the National Democratic Alliance and the United Progressive Alliance - have both cited the need for "political consultations". 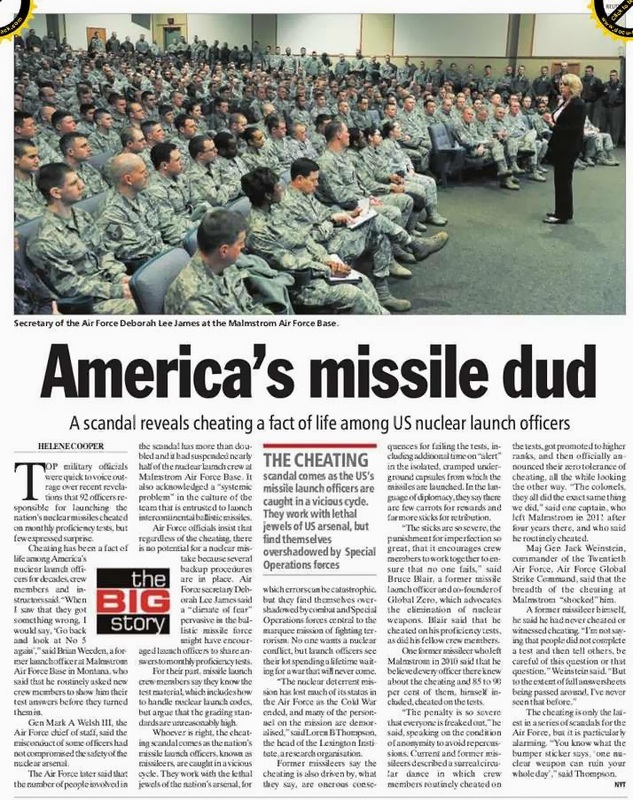 Since 2001, each time the Prime Minister's Office has enquired about this issue, the ministry of defence has truthfully - and deceitfully - reported that there was no consensus. A former top bureaucrat once told me, "Stalling is easy because complete political consensus is impossible. As long as, say, the Khobragade Group of the Republican Party of India has not actively committed support, I can truthfully say we have no consensus yet." Stalling tri-service reform is a cynical disservice to every soldier, sailor and airman; to national security; and to those who pay the opportunity cost for our fiscal inefficiency in defence. It is ironic that one of the world's most ineffective and self-serving bureaucracies and a deeply corrupted political class feel threatened by a military that is consistently cited as India's most admired and respected institution. Defence Minister A K Antony should see the writing on the wall: if he fails to appoint a tri-service chief in his last days in office, his (probably non-Congress) successor probably will. Mr Antony still has the time to do what is obviously right. New Delhi: The defence ministry today pulled up the Navy over the recent spate of mishaps involving warships and cases of moral turpitude surrounding some of its personnel and asked it to address such issues. 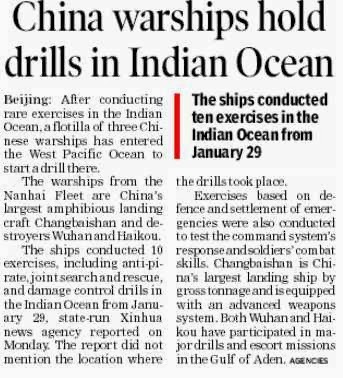 The concerns were conveyed during a meeting a senior Navy official had with a top functionary of the ministry in New Delhi, sources said. The force has been asked to address these issues as mishaps involving the warships could dampen the morale of the force and cases involving moral turpitude would bring bad name to it, they said. The development came at a time when the Navy has seen nine incidents of its warships being involved in mishaps, including one on Sunday. There have also been cases of alleged sexual misconduct and illicit relationship involving some naval officers. In a recent case, a Naval officer Captain (equivalent to Colonel in Army) Manoj Rawat is facing the prospect of being sacked for allegedly having an illicit affair. The ministry is looking into the possibility of leakage of secret documents by the officer, who was posted at the Directorate of Naval Operations. The officer has been recommended for disciplinary action by the Naval headquarters after he was found guilty of having an extra-marital affair. The final decision on his sacking would be taken by the defence ministry. A number of sexual misconduct cases and wife-swapping allegations have dogged the navy in recent years, prompting Defence Minister AK Antony to take "sternest possible action".